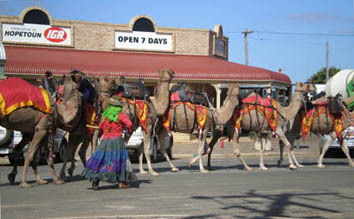 In December Julia and her camels come to Hopetoun, a thriving seaside town at the gateway to the world renown Fitzgerald River National Park. 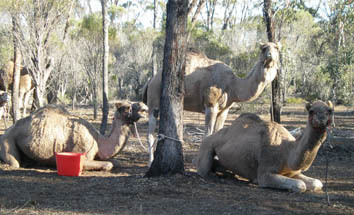 They then trek west along the coast to their bush camp where they reside until April. 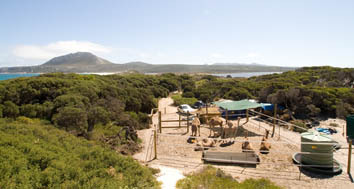 Camped in the shelter of sandhills beside the beautiful Southern Ocean the camels make daily treks along the beach under the watchful guard of East Mount Barren. Sunrise and sunset treks can be arranged by appointment - followed by champagne, bush tucker and the music of Mozart. The trek from Ravensthorpe to Hopetoun takes visitors through towering salmon gums, past verdant farmland and natural bush where wildflowers abound. In spring the area becomes a garden wonderland with one of the worlds most diverse collections of flora. These flowers are displayed at the Ravensthorpe Wildflower Show each September. Educational treks can be organised for adults and school groups. 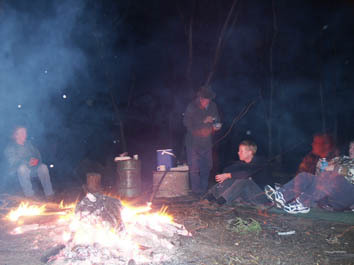 This includes bush survival, navigational skills, local history and information on flora and fauna. All camping equipment and food are provided.